This month Paula at Book Jotter is hosting Dewithon, a readathon celebrating literature by and about writers from Wales. I thought this would be a perfect opportunity to read How Green Was My Valley, a book from my Classics Club list, so I was surprised and disappointed to find that there is some controversy over whether or not Richard Llewellyn can be considered a Welsh author (although his parents were Welsh, he was apparently actually born in England, despite claiming to be born in Wales). I decided to read it anyway and am glad I did because I loved it and it seemed to me that Llewellyn must have identified strongly with Wales and its people, even though he didn’t grow up there. The book was published in 1939 but is set several decades earlier, towards the end of Queen Victoria’s reign, which is something else I hadn’t realised at first. Exact dates are not given, but there are a few clues and references to historical events that provide some indication of the time period. The story is narrated by Huw Morgan, whose family live in a coal mining community in the valleys of South Wales. Huw is only a child at the beginning of the novel, watching his older brothers go off to work in the mine with their father; he expects that one day he will follow in their footsteps, but his academic ability opens up at least the possibility of doing something else. Huw’s school days are not easy – despite his success in the classroom, he is bullied both by the other boys and by his teacher – but at home he receives plenty of guidance and advice, of various sorts, from his family and friends. Huw’s recollections of his childhood are full of nostalgia and affection, but there is always a sense that danger and tragedy could be just around the corner and we know that Huw’s valley was perhaps not as ‘green and bright’ as he remembers it. This is symbolised by the descriptions of the slag heap which is growing larger by the year as more and more of the earth is mined, casting a shadow over the valley as it spreads and threatening to engulf the houses below (it was hard not to think here of the Aberfan disaster of 1966). Mining is an integral part of the lives of the Morgan family and the rest of the community, so while it is a constant source of conflict throughout the novel – Huw’s father and brothers become involved in strikes, the formation of unions and protests against the sliding scale of pay – it is also an important source of employment and income. Everything that happens in the book feels realistic and Llewellyn adds to the authenticity by trying to capture the patterns and cadences of Welsh speech both in the dialogue and in Huw’s narration (though maybe someone from Wales who has read the book can tell me whether it’s as accurate as it sounded to me). The story itself seems very autobiographical and I could have easily believed that Huw’s experiences were drawn from the author’s own life. 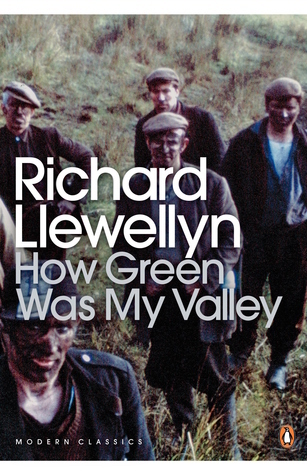 I was surprised, then, to find that not only was Llewellyn not born in St Davids as he claimed, he also didn’t come from a mining background and was more likely to have carried out his research for the book by talking to miners rather than by going down the mines himself. Anyway, this is a beautifully written novel with characters I came to love and care about, particularly Huw himself, his beloved sister-in-law Bronwen, who is such a big influence on him from early childhood onwards, and his sister Angharad, faced with choosing between two different men and two different ways of life. At first I thought it was going to be a long, slow read, but as I gradually became more and more engrossed in Huw’s story the pages started to fly by much more quickly than I’d expected. I’m not sure if I’ll look for any of the sequels, which don’t seem to be as highly regarded, but I’m so glad I read this one and got to know Huw and the Morgan family. I think I read this book in high school, and I just loved it. I can’t believe anyone would argue about whether he is Welsh. He writes so lovingly about the country. Yes, his obvious love for Wales makes him Welsh enough for me, whether he was born there or not. I’m glad you loved this book too. I wouldn’t think the Welsh would be quibbling about it, if that’s who is. A splendid post, Helen. Many thanks indeed. And thank you for hosting this, Paula. I was going to read this book eventually anyway, but Dewithon gave me a push into actually picking it up and starting to read. What a great book to start your project with, Judy! Thanks for the link to your review. This is an insightful post Helen. Yes it does come across as autiobiographical – in fact the story echoes the life of a highly regarded figure on the Welsh literary scene:Gwyn Thomas. He was one of 12 children in a mining family but was so academically bright he got a place at Oxford. He became a teacher and broadcaster as well as an author. Thanks for that information. I didn’t know about the similarities with Gwyn Thomas’s life. As both his parents were Welsh he would have been culturally Welsh and often the ones who leave their home country, usually for work – end up being more nationalistic than the ones who stay and take the place for granted. Yes, I don’t think it really matters where he was born – he obviously considered himself to be Welsh and loved the country, which is more important. This sounds wonderful – a must-read, in fact. And yes, as soon as you mentioned the slag-heaps I thought of Aberfan. How sad to know that the danger had been recognised so many years earlier. Yes, it’s a great book! I hadn’t expected to like it so much. The descriptions of the growing slag heaps are quite poignant in light of what happened later. This is one of the books I’ve been meaning to read for a long time and recently I bought a copy and have made a start. I think the question of his nationality is interesting because although I was born in England I think of myself as part English and part Welsh as my father was English and my mother was Welsh – I identify with both. I hope you like it as much as I did. I definitely think it’s possible to identify with a country without being born there and I thought Richard Llewellyn’s love of Wales came across very strongly. I’ll be interested to see your thoughts on The Green Hollow. I haven’t read anything by Owen Sheers yet. The book certainly sounds better than the movie, which I thought was sad and a little depressing. The book is depressing too in places and Huw’s story is quite sad, but I loved it anyway. I think sometimes things work better on paper than they do on film. I absolutely loved this book. I turned to it after seeing the movie (a really old film) several times. I must admit I was about to turn fifteen when I read it, but I’ve never forgotten it. A superlative classic! Yes, it is! I’m glad you loved it too. I’ve never seen the film but I think it would be interesting to watch it now that I’ve read the book. This is interesting, as I wanted to read this and started it (years ago) and just could not get into it – I can’t really imagine why. That’s a shame. I did think it got off to a slow start, but it picked up after a while and I ended up loving it.